Walters says that the atmosphere changed in the Ireland camp last year. 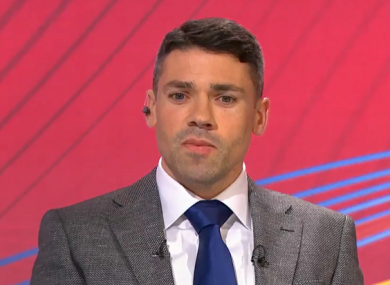 JONATHAN WALTERS SAYS that the atmosphere in the Ireland camp “went right downhill” towards the end of Martin O’Neill and Roy Keane’s involvement with the team. O’Neill and his coaching staff parted company with the FAI last November, following a poor run of results which ended with Ireland getting relegated from their Uefa Nations League group. Walters, who announced his retirement from football on Friday due to injury, says that those final months under O’Neill and Keane were difficult for everyone. “Yeah, the atmosphere changed,” he told Virgin Media Sport. “Results don’t help. We had a huge year of not winning, but the atmosphere was definitely different from when I first met up. It’s quite a hard thing to say when you used to absolutely love meeting up. It was great, I used to always look forward to it during the break in club football. “When lads got days off, you didn’t really care. You used to just love coming to meet everyone and being involved and being able to play for Ireland. It’s an unbelievable feeling. Walters also referred to a leaked WhatsApp audio message, purportedly of Stephen Ward, in which he which discussed a falling out between Harry Arter and Roy Keane. During a press conference at that time, O’Neill effectively confirmed that Ward was the individual speaking in the WhatsApp recording about Keane supposedly launching a tirade of abuse at Arter and Walters over not training while apparently injured. We all know the leaked WhatsApp has got a lot to answer for with Stephen Ward and I think that was probably a mild version of actually what happened,” said Walters. “There’s various things like that so that changed a bit of perspective on it but in saying that, I was playing and the manager would look after me as well because at club level, I had injuries where I wasn’t playing for a lot over the course of two years. Reflecting on his decision to retire, Walters said he suspected he was coming to the end of his football career when he began his rehab from an Achilles injury. “I think it was a case of no other decision really to be made,” he said. He added that representing Ireland was something he wanted to do from a young age. “I was born in England, but my Mum is from Dublin in Ballybough. And every time we weren’t in school, we were in Ireland. We spent summers here, Christmases here, Easters here, every time growing up. “It’s what I wanted at a very young age. I got into the academy system quite late as a player [I was] 15, 16 and I had an exceptional year my first year and I think I was the top scorer in England for my age group. “I got asked what I wanted to do and that was my answer straight away [I wanted to play for Ireland]. I was involved in the U20′s and U21′s and I didn’t get back into it until quite late when I was 26 or 27. On a personal point of view it means everything really. That’s the most difficult thing I’ll find I think, looking back going through any photos, watching any videos, that’s the most difficult thing is the Ireland side of it. The 35-year-old Walters retires with 14 goals in 54 international games. He last lined out for Ireland way to Wales during a 4-1 Uefa Nations League defeat in Cardiff. Email “Leaked WhatsApp 'was a mild version of what happened' in Ireland camp, says Walters”. Feedback on “Leaked WhatsApp 'was a mild version of what happened' in Ireland camp, says Walters”.